If coffee and travel have something in common, it’s the sense of awakening they both give you. Coffee awakens your body, while traveling awakens your mind and soul. When two adventurous and energetic individuals combined the two, it resulted in a brand as unique as a far-away country and as bold as your morning cup of joe. 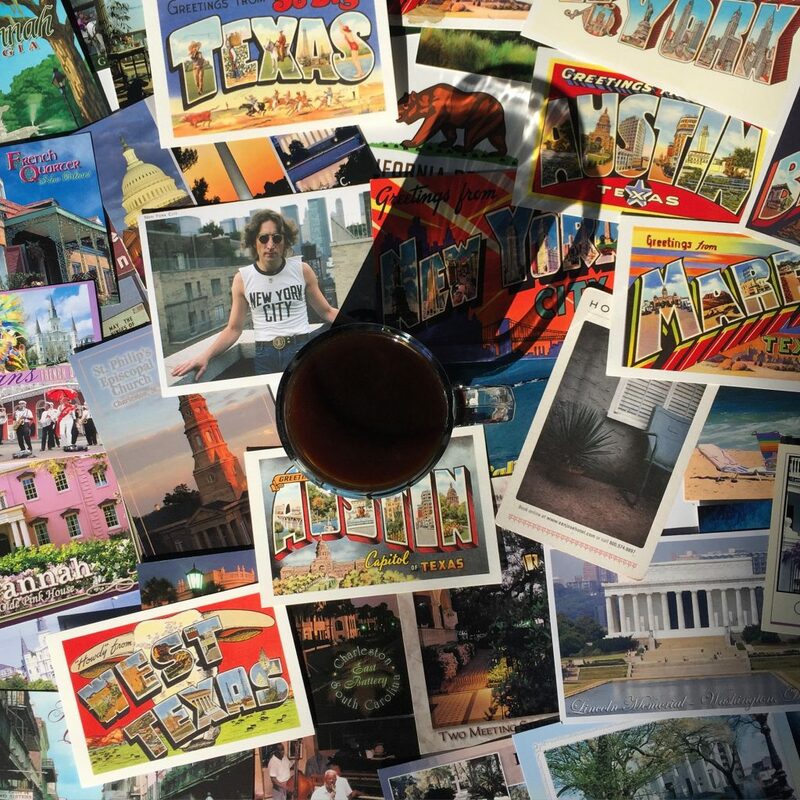 Atlas Coffee Club was created by Michael Shewmake to tell the story of coffee from different countries and give people an opportunity to explore the world through its many coffee flavors. Subscription to the club guarantees a pack of fresh coffee from a new destination will arrive on your doorstep every month. Only a couple of years back, Shewmake had as much knowledge about coffee as many of us, which is close to zero. But a chance encounter with a local barista in California sparked an idea for a company that would change the course of his life. Imagine you’re enjoying your daily cup of coffee and casually ask the barista to tell you about it. In response, he pulls simple brown bags of coffee off the shelves and proceeds to go into detail about the origins of the beans and brewing methods. When he finishes some twenty minutes later and the bags are back in place, what are you left with? “There are so many stories behind coffee, and all you see is a brown burlap bag. I wanted to tell those stories,” Shewmake told me. And that’s how a data scientist decided to quit his job and pursue his dream of spreading the word about coffee from different countries. But doing it alone is not as fun and productive as when you bring like-minded people together. Jordan Rosenacker was introduced to Shewmake by a mutual friend. The two met in New York over a weekend. By the end of the visit, not only did Rosenacker come on board the Atlas Coffee Club team, but he also proposed a cross-country road trip to jump-start the new company. “Hey man, both of our leases end in a month. You wanna take a road trip?” sounds like an unlikely thing to say to a person you’ve known for two days, but that’s exactly what happened. There’s no better way to share how different coffee is made than by giving it away for free. 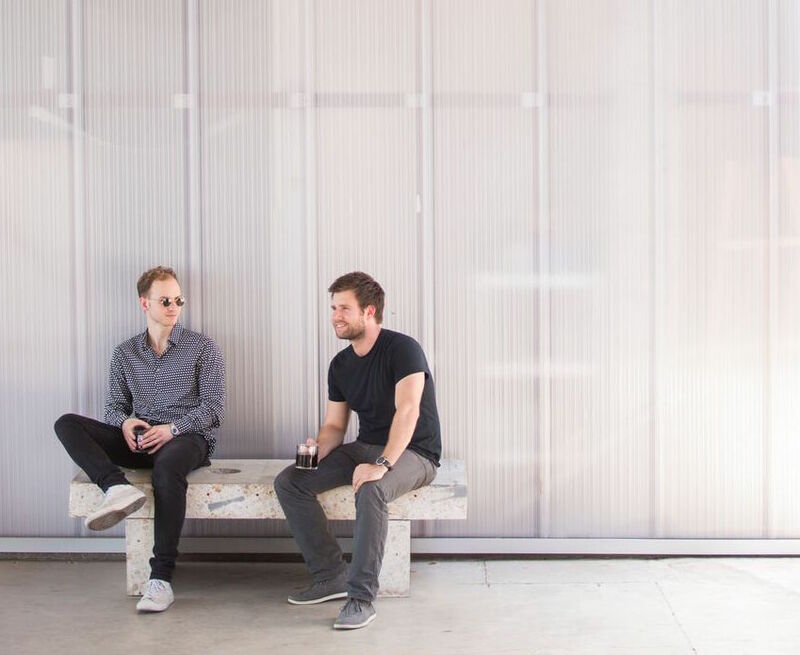 Shewmake and Rosenacker took a cross-country trip from New York to Los Angeles and held pop-up coffee shops in cities along the way. In Washington D.C., they brewed coffee at the National Geographic headquarters; in Charleston, near the iconic pineapple fountain; in Virginia Beach, on the boardwalk; in Austin, at Gourdough’s; and even in the middle of the desert in Marfa, TX. 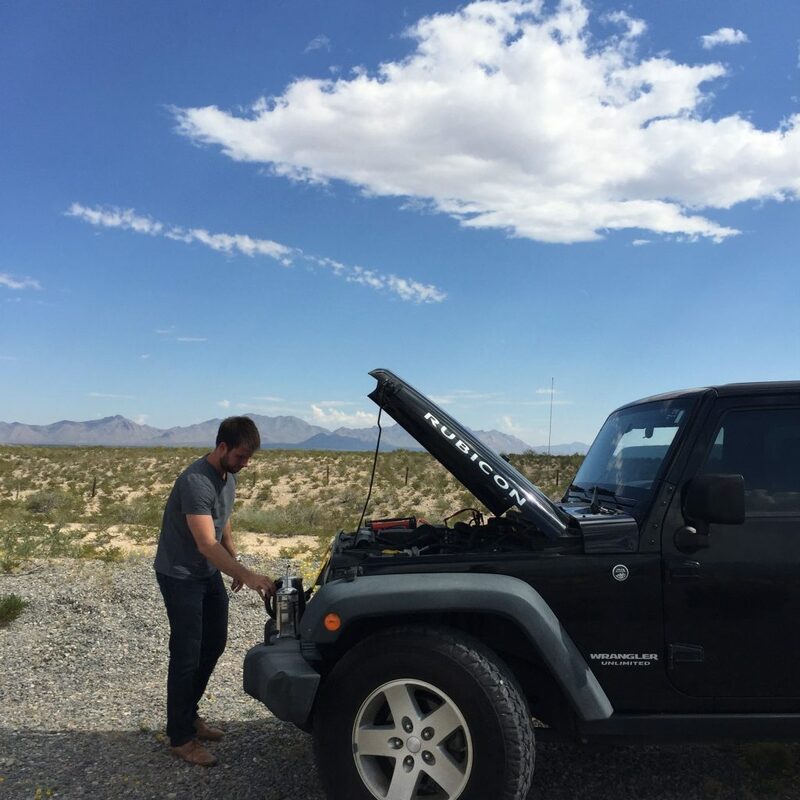 Making coffee when you’re traveling in a Jeep with minimum equipment can get tricky because you always need power to boil water. Using a battery adapter they borrowed from Shewmake’s dad, the duo could utilize the car battery and have six power plugs available. 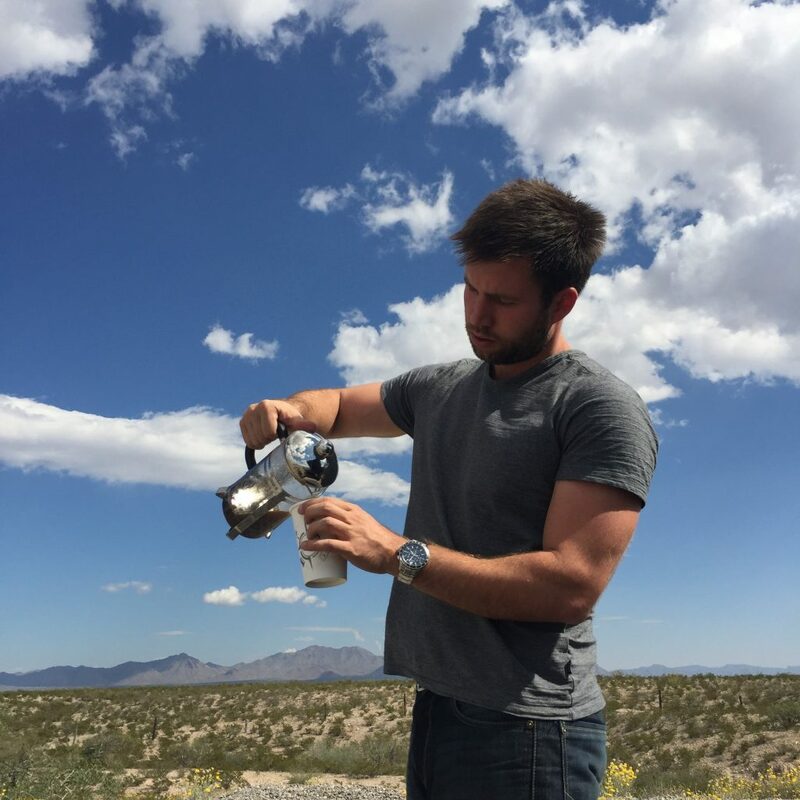 It doesn’t get more adventurous than brewing coffee off a Jeep, but it works wherever you are, even in the middle of nowhere. And that comes in handy when you’re craving a cup of coffee somewhere in the cotton fields of North Carolina. You might get a suspicious look from a passing policeman who notices two guys leaning over the motor with French press in hand, but good coffee is worth it. The road trip from coast to coast took one and a half months and ended up making friends and partners of two strangers. “We literally put ourselves in a box and it was a good way to get to know each other. We decided if we don’t hate one another after a week of being in a Jeep together, we will be good partners,” concluded Rosenacker. After the road trip, Rosenacker settled in Austin, while Shewmake and the rest of the team joined almost a year later. 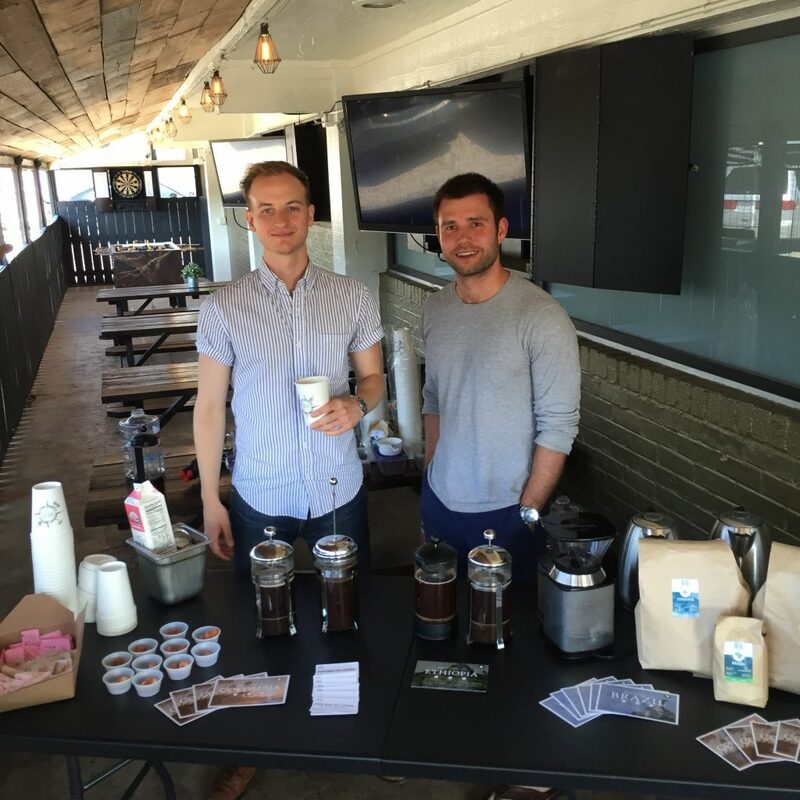 Even though Atlas Coffee Club is an online business that can be run from anywhere in the world, the partners felt Austin would be a great home for the company. At the moment, Atlas Coffee Club offers 15 coffee varieties from countries like Ethiopia, Kenya, Guatemala, Indonesia, Brazil and Peru, but the number is growing. Next in line are Tanzania and El Salvador. Shewmake and Rosenacker are constantly working on expanding their coffee portfolio and adding flavors no one has ever tried before. They source single origin coffee that helps to ensure sustainable farming practices and the highest possible quality of coffee. Beans are delivered to the U.S.A. raw, and are roasted in Arkansas where Shewmake is from. But it’s not only about the great quality, full body and good taste. The idea is to introduce subscribers to unique flavors that surprise them and make them think. Then, they take it one step further and talk about the country where the coffee comes from. 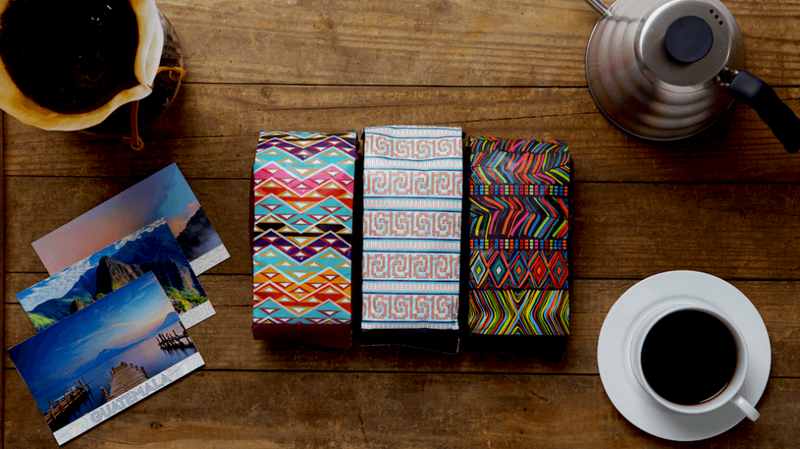 Even package design is based on the local textiles and landscapes of the country of origin. For example, the design for coffee from Costa Rica was inspired by an ox cart wheel. Ox carts are used in Costa Rica to transport coffee because of poor infrastructure, and unique patterns help each family recognize their own cart. Atlas Coffee Club’s coffee bag reflects the consistency of patterns around the spoke of the wheel. Learn more and subscribe at atlascoffeeclub.com. Where does your favorite coffee come from?